Thank you so much for giving us the opportunity to adopt such a great pug! Owen is the happiest and friendliest dog. He loves playing with his brother and sister. It’s unbelievable how a blind pug can adapt so well to his surroundings. He knows where his food and water bowls are and where to find the back door when he has to go outside. Just yesterday we brought him to the beach for the first time and he loved it. We are very happy to have such a sweet dog! He will always be loved and well taken care of here. 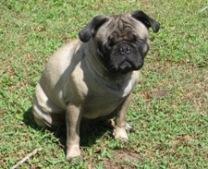 Here are some photos of Owen with his brother Simba (Italian Mastiff) and Rosie (Pug).